New South Welshman Andre Stolz has claimed the South Pacific Open Championship after an intense playoff with Queenslander Michael Wright. Wright and Stolz finished regulation play in Noumea tied with a 16-under par score of 268. 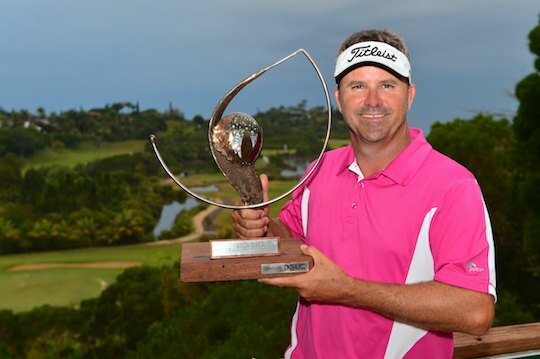 The pair played the 18th hole at Tina Golf Club five times before Stolz emerged the champion. “I am relieved more than anything,” said Stolz. Staying calm throughout the playoff was the key for Stolz who made par on the treacherous 342 metre par-4 18th hole to seal the title. “In golf I try to take it one shot at a time. Basically nothing was going through my mind,” added Stolz, who switched clubs for his fifth tee shot. Stolz played consistent golf throughout the tournament with rounds of 67, 66, 69 66 to claim his first victory since 2011 Thailand Open. Throughout the playoff Michael Wright was consistent, making four consecutive pars before finding the left lateral water hazard on the 18th to seal his fate as runner-up. “I had been stripping my three iron all day as well as four times in a row in the playoff,” said Wright. Victorian Matthew Griffin finished in outright third place on 14-under the card. In the past three years Griffin has recorded first, second and third place finishes at the South Pacific Open Championship. A further shot back was New South Welshman Chris Campbell and rounding out the top-5 was Tasmanian Clint Rice and Brett Rankin on 12-under the card. The PGA Tour of Australasia will now head to Kalgoorlie in West Australia for the WA Goldfields PGA Championship.